Companies of all sizes are always on the prowl for ways to improve productivity, attract and retain top talent, and increase employee engagement. Maybe the answer is simple: reduce stress with Financial Wellness. What is financial wellness? 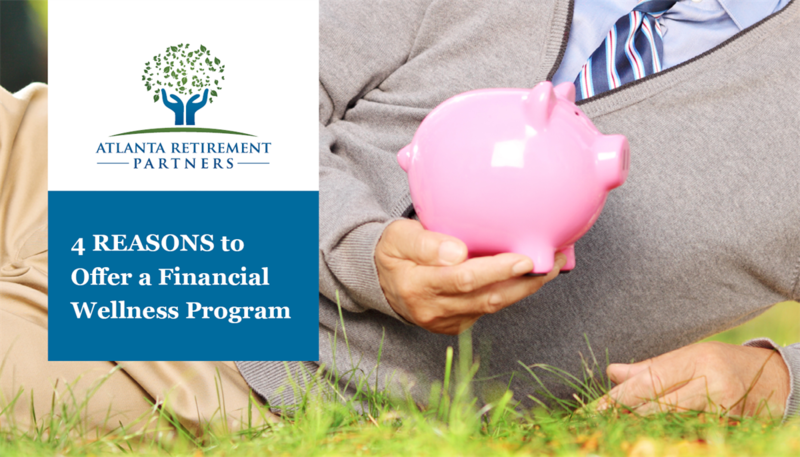 As an employer, it is a program or set of programs that aim to improve the financial behavior of your employees. The program itself will vary based on the needs for your workforce but the goal is the same: to help employees find balance and control over their finances. 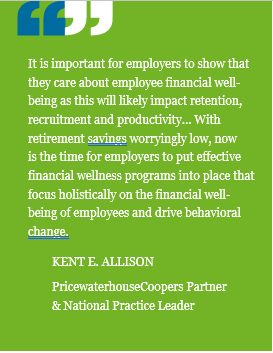 Improving employees’ financial wellness may lead to a more productive workforce with less absenteeism and higher retention rates. It may also help create a healthier workforce which has short and long term eﬀects on your company’s bottom line. Personal finances prove to be a huge distraction for employees. It may come as a surprise to learn that nearly half (46%) of all employees say that at work each week they spend three hours or more thinking about, or dealing with, issues related to their personal finances.1 Over the course of a year, that’s 156 hours or 19.5 days! By offering education and support for employees on how to better manage their finances you may be able to reduce “presenteeism” or time spent at work focused on financial stress. It has been said that employees will leave their employer for as little as another $1 per hour. By offering a wellness program, you can help your employees control their finances through budgeting, debt reduction, and savings. Thus, it reduces the likelihood that happy, financially healthy employees would leave for another employer. For example, if you have an employee that makes $50,000 per year and they leave for a competitor, if your replacement costs are 50%, that means it will cost your company $25,000 to find a suitable replacement employee. However, corporate culture that promotes financial wellness may help you reduce turnover and could save your company money. Help your employees live more financially secure lives. This will not only enrich company culture and the health of your workforce but research has shown 3:1 return on investment.6 No matter the reason you decide to start or enhance a financial wellness program, the bottom line is that you are offering an invaluable benefit and taking steps toward helping your employees take control of their financial futures. At Atlanta Retirement Partners, we genuinely care about the well-being of your participants. We work hand-in-hand with you to seek the most effective employees benefits, from a well- designed retirement plan to a comprehensive financial wellness program. 1 PricewaterhouseCoopers LLP. “Employee Financial Wellness Survey”(2016): Pg. 8. PWC. April 2016. 3 Aon Hewitt. “2016 Hot Topics: Retirement and Financial Well-being.” Pg. 6. 2016. 4 Financial Wellness Landscape Analysis: An Overview of the Need for Workplace-Based Financial Wellness Programs. ING Employee Benefits, 2013. 5 “Aon Hewitt Analysis Shows Upward Trend in U.S. Health Care Cost Increases.” Aon Hewitt, Nov. 2014. 6 Dr. E Thomas Garman.“Increase the Bottom Line by Helping Distressed Employees During Challenging Financial Times” SHRM Webcast. Aug 2008.